Can Inter win their sixth league title in a row? New Inter boss Benitez under pressure to win clubs fifth straight title. Ailing clubs Milan and Juventus hire new managers. Former Inter star Adriano signs for title rivals Roma. The cast may have changed but the script is expected to remain the same. Inter Milan may have swapped coach Jose Mourinho for Spain's Rafa Benitez but the club is still expected to win its sixth straight title. Inter's 3-1 win over nearest rivals Roma in the Super Cup only served to underline the club's superiority over its Serie A rivals. The season's curtain raiser is usually played between the Serie A and Italian Cup winners but with Inter winning both, Roma took part simply because they were runners-up in both competitions. 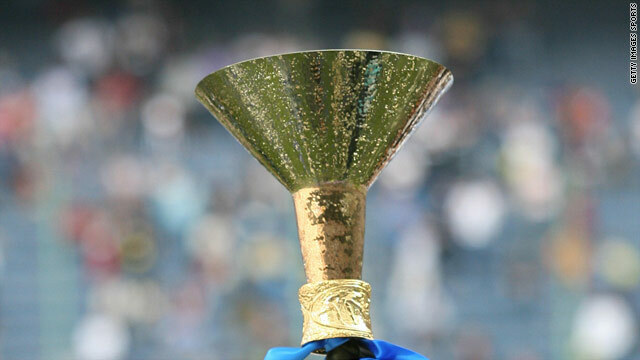 The fact that Ranieri's charges were dispatched again meant that Nerazzurri picked up their fourth trophy of 2010. Number five could well be a formality. It's been a relatively quiet close season for the Serie A and European Champions League holders with the $35 million sale of Mario Balotelli to Manchester City being the biggest news. Replacing him, however, is the exciting 18-year-old attacker Brazilian Philippe Coutinho who Inter bought in 2008 and have had parked at Vasco de Gama ever since. If Inter do find themselves short of a striker, Benitez will have to resist casting envious glances at rivals Roma who have secured the signature of old boy Adriano to replace the Genoa bound Luca Toni. Known as "The Emperor" during his pomp, the Brazilian scored 48 goals in 123 games for Inter and has been brought in by Claudio Ranieri to play in an attacking trident with Francesco Totti and Mirko Vucinic. In a bid to revive their fortunes, the two other giants of Italian football AC Milan and Juventus have installed new coaches. Il Rossoneri may have been placed third last year but 10 points behind second-placed Roma was nothing to crow about. Leonardo has since been ejected in favor of Massimiliano Allegri. Allegri has won coach of the year for the last two terms -- a magnificent achievement considering he has been at the helm of lowly Cagliari. In a further bid to revive their fortunes, the club are looking to bring in former Inter striker Zlatan Ibrahimovic from Barcelona. Meanwhile, seventh placed Juventus have drafted in Luigi Delneri who is fresh from securing a spot in the Champions League qualifiers with Sampdoria. The Old Lady has also boosted its chances by signing attacking midfielder Alberto Aquilani from Liverpool and Milos Krasic of CSKA Moscow. Of the new boys, Lecce are the only club with any real top-flight experience having bounced between Serie A and B for the last 25 years. Promoted as champions they are expected to stand a better chance of retaining their place among Italy's elite than Cesena and Brescia who achieved promotion by finishing second and via the playoffs respectively. There are few players who enjoyed a better time last year than Inter Milan's Dutch playmaker Wesley Sneijder. The 15 million euro signing from Real Madrid won the Champions League and domestic double with Inter last season and was awarded the silver ball and bronze shoe in South Africa where Holland came runners up at the World Cup finals. As long as fatigue doesn't get the better of him, the 26-year-old should continue to dominate Serie A. Milan's young Brazilian Pato showed flashes of brilliance last season including a brace against Real Madrid at the Bernabeu but a succession of injuries meant it wasn't to be his season. This year the 2009 Serie A Young Footballer of the Year will be looking to improve on last term's 14 goal haul. If the 20-year-old star, nicknamed the Duck, can stay fit, then he and fellow Brazilian Ronaldinho could fire Milan back into contention for the title in 2011. October will mark the anticipated return of one of Serie A's most talented players. Banned for nine months following a failed doping test after a match against Bari in 2009, Adrian Mutu will resume the striking career that has seen him score an impressive 100 goals in 221 matches for Fiorentina. Should the troubled Romanian be able to pick up where he left off then La Viola have every chance of finishing in the top four. Once again, the title will be Inter's to lose. The strength of their squad and experience of their new boss Benitez will make it extremely difficult for the likes of Roma and Milan -- their only genuine rivals for the championship. Having slipped to seventh place last season, Juventus will be desperate to secure a top four spot and Champions League football again. The likes of Sampdoria, Palermo and Napoli who did so well to secure fourth, fifth and sixth place respectively last term will need to keep hold of their best players during the last days of the transfer window if they stand a chance of repeating their success. Gazzetta dello Sport's Tancredi Palmeri - "After a clean sweep of trophies in 2010, what can Inter do for an encore? In recent seasons, the Nerazzurri have changed the game of prediction: it was just impossible to see past them retaining their title. Not much has changed either. "However, there are a couple of shadows over the San Siro. The first is the exit of the Jose the "Special One" and the arrival of Rafa Benitez. The Spaniard will hear whispers of "would Mourinho have done this?" follow every decision or substitution he makes. "The second shadow is the possible return of the long-haired Swede, Zlatan Ibrahimovic. At the moment is not known if he will end up at AC Milan -- Inter's bitter, city rivals -- but the forecast for the coming season is clear: without Ibra playing alongside Pato and Ronaldinho, Inter are odds-on to set the new Italian record by winning their sixth title in a row. "As for the others, Juventus have been building a completely new squad. La Vecchia Signora have imported a sports director and coach from Sampdoria and changed much of their playing staff. "Cannavaro, Poulsen and Diego have left; Aquilani, Krasic, Quagliarella have moved in. The transfers lack big-name muscle but the Bianconeri are working for the future. This season they will be satisfied with Champions League qualification. "Roma are still too dependant on Totti's performances. The old Capitano is still good for 15 goals a season, but injuries are hampering his potency. Adriano will also take a long time to settle and find his way through Italian defenses. "Genoa had an impressive close season, signing Toni, Rafinha and the Portugal goalkeeper Eduardo. They could be the surprise of the season with their entertaining football (the coach Gasperini has been renamed "Gasperson" in honor of his shared love of attacking tactics with Alex Ferguson). "Finally, Napoli and Palermo have exciting line-ups but a shortage of replacements on the bench, and with the rough-and-tumble of the Italian league this weakness will be exposed. "My final Serie A prediction in order of their final positions: Inter, AC Milan (without Ibra), Juventus and Roma in Champions League. Top scorers: Samuel Eto'o (he should play as pure forward this season) or Giampaolo Pazzini (the Sampdoria number 9 who is due an international call up)."